I am choosing to end the month of all-chocolate posting with my favorite chocolate recipe of the year. 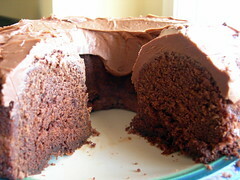 This is another one from Nestle Chocolatier's online recipes, and can be found here. What I love about this pie is that it is so easy, but truly decadent. Minimal effort for maximum taste - this would be a great dessert for the person who works full time but still wants to have a dinner party. 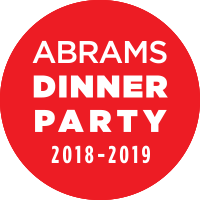 Just make it the night before, and the dessert will be perfectly firm and smooth by the evening. 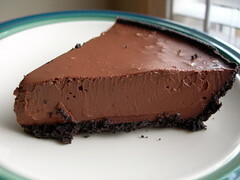 The piece pictured is way too much for one person, because it is incredibly rich, dark, and smooth in every mouthful. I will make this again, and next time I think I'll try it in a tart pan, or possibly in individual servings. As you can see I substituted a chocolate crust for the recommended graham cracker one, because I just couldn't dream of putting something so rich into a non-chocolate crust. In large saucepan, over low heat, melt chocolate chips with condensed milk. Remove from heat; stir in vanilla. Shape into 1-inch balls; roll in desired coating and/or decorate with frosting and candies. Chill 1 hour or until firm. Store leftovers covered in refrigerator. My notes - you can substitute the vanilla extract for any other extract, or even a bit of flavored liquor. Grand marnier would be nice, for instance. One year I rolled these in chili powder, a la the movie Chocolat, but you have to make sure you are using pure chili powder, not the kind with onion and garlic added. The quality of chocolate is key here. Spend an extra dollar and buy Ghiradelli, but stay with the semi-sweet. I tried bittersweet once and it just didn't work as well. I also always add a pinch of salt. It really improves the depth of flavor in the truffles. To make these even better, you can chill them and then dunk them in tempered chocolate, preferably of a different variety (bittersweet or milk chocolate), and then roll in desired toppings. The tempered chocolate will harden and will result in a more professional crispy bite into the truffle. 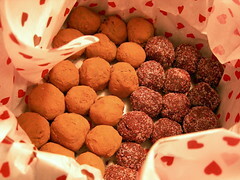 I have so many stories that involve these truffles. One year I made them for my student workers during finals week. It was a Saturday, when I lived in Indiana, and there were tornado warnings that included a black sky, torential rains, and people hiding in stairwells. Luckily, the music library was a safe place, and one student said in a small voice, "At least I had these truffles." This recipe comes from Treasured Recipes from the Charleston Cake Lady. If you are like me and often flip through cooking shows, chances are that you've seen Teresa Pregnell featured on a show about the south or about cakes. She is legendary! In my search for the perfect cake to give away, I picked the chocolate chip cake recipe from this book. There are several good looking pound cake recipes as well. This had the ingredients of many cake recipes, but the extended beating time adds an incredible delicate texture to the cake itself. This was wolfed down by my co-workers, despite the mass injury the cake suffered when I was removing it from the pan. In a large mixing bowl with a mixer, blend the cake mix, sugar, sour cream, and oil on low speed for 1 minute. Add the eggs one at a time, blending well after each addition. Increase the mixer speed to medium and beat for 4 minutes. Add the vanilla extract. Fold the chocolate chips into the batter by hand and stir gently until they are well distributed. Pour the batter into the prepared pan and bake for 50 minutes, or until a tester inserted in the middle of the cake comes out clean. Remove the cake from the oven and allow it to cool in the pan. 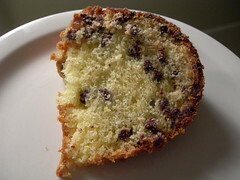 Invert the cake onto a plate and enjoy your delicious chocolate chip cake. I have decided that February is all about rich chocolate recipes. First up we have the Chocolate Mayan Bundt Cake. The recipe is from the Nestle Chocolatier baking chocolate site, but I have to admit that the store I went to that day didn't have the Nestle so I used Ghiradelli. It was just as good. This cake is moist, dense, and wonderfully rich and spiced. I'm sold on the cake but am not sure the icing/glaze does it justice. When I make it again, I'm going to make a darker chocolate glaze with less sugar, or just serve it plain with whipped cream. I brought this cake in for my students and they devoured it.